So, Epigenetics. The lack of identified genetic determinants that fully explain the heritability of complex traits, and the inability to pinpoint causative genetic effects in some complex diseases, suggest possible epigenetic mechanisms to be involved. A broad interpretation of epigenetics refers to any structural change to the chromatin template that leads to functional changes in terms of gene expression. To help understand this rather complex regulatory system epigenetics can be broken down into three major steps. recruiting additional enzymes and proteins or specific non-coding RNAs that either initiate, fine tune or terminate gene expression. CNS development and function is known to be regulated epigenetically. Therefore, it is not surprising that many neurologic diseases including epilepsy actually result from primary or secondary epigenetic lesions. Chromatin remodeling. 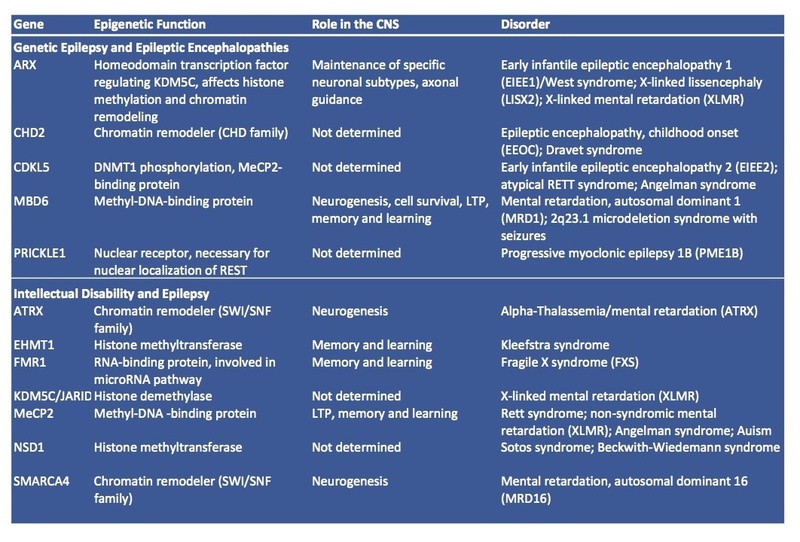 Many types of epigenetic proteins are involved in the pathogenesis of epilepsies. Recent studies identified CHD2 as candidate gene in Dravet-like fever associated epileptic encephalopathy coding for an ATP-dependent helicase with chromatin remodeling function. Remodelers like the CHD protein family alter gene expression by modification of chromatin structure, meaning that they can help to improve accessibility of the transcriptional apparatus to the DNA template either by moving, ejecting or restructuring nucleosomes. It is the energy from the hydrolysis of ATP that allows the remodeling complexes to reposition (i.e. slide, twist or loop) nucleosomes along the DNA, expel histones away from DNA or facilitate exchange of histone variants, and thus create nucleosome-free regions of DNA for gene activation. A different subtype (i.e. SWI/SNF) of chromatin remodelers, SMARCA4, has been identified in patients with autosomal dominant mental retardation syndrome. The disease is characterized by multiple congenital anomalies and intellectual disability. Additional findings include hypotonia, microcephaly, and seizures. ATRX, another chromatin remodeler of the SWI/SNF family, was found to be mutated in Alpha-thalassemia/mental retardation (ATRX), which is associated with occasional seizures. The histone code. Posttranslational histone modifications comprise a second major epigenetic mechanism that seems to be affected in epilepsy. Modifications include acetylation, methylation, phosphorylation, ubiquitination, and sumoylation and target specific amino acids (e.g. Lysine or Arginine among others) in the N-terminal tail of histones. Some modifications may activate gene expressions, while others work in the opposite direction. The same modification can have opposing effect in a dose-dependent manner. From currently available data it appears that histone modifying enzymes and readers of histone tags are frequently identified in intellectual disability syndromes with associated epilepsy. EHMT1 is a histone methyltransferase that is implicated in learning and memory and was recently shown to be mutated in Kleefstra syndrome. KDM5/JARID1 is a histone demethylase, and as such erasing methylation marks from histones. Its function in the CNS is not further determined, but a mutation in this gene has been associated with X-linked mental retardation. Insertion/missense mutations of the transcription factor ARX have been linked to epileptic encephalopathy, lissencephaly and x-linked mental retardation. ARX is a key regulator of KDM5C function and has therefore an indirect effect on histone methylation patterns. DNA methylation is essential for genomic integrity, X chromosome inactivation, and genomic imprinting. It is further critical for a variety of neurobiological and cognitive processes including neurogenesis, stem cell maintenance, synaptic plasticity, as well as learning and memory. MeCP2 is a typical reader of DNA methylation, abundant in the brain, and, when mutated, the cause of classic Rett syndrome. Seizures are reported in up to 90% of affected females, with generalized tonic-clonic seizures and partial complex seizures being most common. MBD5 is another DNA methylation binding protein and was identified as causal locus of intellectual disability and epilepsy in patients with 2q23.1 microdeletion syndrome. CDKL5 codes for a cycline dependent kinase. Mutations in the CDKL5 gene have been associated with an X-linked dominant early infantile epileptic encephalopathy. The protein has been proposed capable of interacting with and phosphorylating MeCP2 and DNMT1, thereby influencing gene expression and DNA methylation. More to come. MicroRNAs provide still another complex layer of epigenetic signaling. They are thought to be essential for correct function of the CNS, which in fact shows the broadest spectrum of microRNA expression of all human tissues. A number of papers have shown the relevance of small non-coding RNAs for genetic and symptomatic epilepsies. Furthermore, FMR1, the gene associated with Fragile X syndrome, is a RNA-binding protein and has been linked to microRNA signaling. Finally, there are a number of transgenic mouse models with mutations targeting epigenetic genes like Hdac4 or Bmi1 among others. As animals with such mutations display seizures or increased susceptibility to seizure induction, we can speculate that sooner or later we will also identify these genes in human epilepsy syndromes. This entry was posted in Epigenetics, Epileptic encephalopathy and tagged ARX, ATRX, CDKL5, CHD2, EHMT1, FMR1, KDM5, MBD5, meCP2, miRNA, regulation. Bookmark the permalink.